"Sebkha" redirects here. For the city in Mauritania, see Sebkha, Mauritania. Sabkha (Arabic: سبخة) is a phonetic translation of the Arabic word used to describe any form of salt flat. Geographically, sabkhas can be sub-divided into two broad categories. Coastal sabkhas – located in the upper intertidal to supratidal zone of arid coastlines and strongly influenced by water of a marine origin. Continental sabkhas – occurring in inland areas of arid regions and influenced by ground water. The accepted type locality for a coastal sabkha is at the southern coast of the Persian Gulf, in the United Arab Emirates. The origin and progression of coastal sabkha development at the southern shore of the Persian Gulf was first discussed in detail in the seminal paper by Evans et al. 1969. The southern shoreline of the Gulf is a shallow, low-angle carbonate ramp characterised by an evaporitic supratidal system passing offshore, via a broad carbonate–evaporite intertidal environment, into a carbonate-dominated subtidal system. This is a low-energy setting with a small tidal range (1–2 m) and low wave energy as a result of the limited fetch. High rates of evaporation result in salinities of 45–46 g l−1 along the open-marine coast of Abu Dhabi and up to 89 g l−1 in more-restricted lagoons. The coast of Abu Dhabi is locally protected from open-marine conditions by a number of peninsulas and offshore shoals and islands associated with the east–west trending Great Pearl Bank. In the khor-lagoon-sabkha model, an initial rise in sea-level floods coastal areas and creates shallow water features. If the features silt up, or the land rises, or the sea level falls, then the trapped water evaporates, leaving a flat salt pan, or sabkha. If the coastal region has irregular topography, then the flooding creates large independent creeks, or khors. A khor is a shallow, subtidal flat or tidal inlet. The inlet may host grey mangroves, depending on whether less saline water is available from wadis or groundwater. As sediment begins to accumulate, the khors become more shallow and form a lagoon, or intertidal flat. The lagoons continue to fill until the lagoon floor is exposed at low tide, and the sabkha begins to form. A sabkha may be inundated during higher than normal spring tides, after rainstorms, or when driving winds push seawater onshore to a depth of a few centimeters. Mature sabkhas are only flooded after heavy rainstorms and may eventually coalesce to form a sabkha coastal plain. These coastal plains are very flat, with reliefs between 10–50 cm, and their seaward slope can be as little as 1:1,000. The flatness of a sabkha is enhanced by aeolian siliciclastic dust being deposited in the topographic lows with most of the relief caused by evaporites. These environments can be found laterally contemporaneous in parallel belts to the coast as well. Coral reefs, barrier islands, and oolite shoals form the barrier with the open shelf. These types of deposits are indicative of higher energy and protect the khor-lagoon environments, allowing for the growth of mangrove swamps and algal and cyano-bacterial mats that prefer the more closed, lower energy environment. Inland of this are the supratidal sabkhas. The sabkhas can be as wide as 15 km when seaward of dune fields supplying large amounts of sediment. Sabkhas seaward of low outcrops of Miocene carbonate-evaporites or alluvial fans off the Oman fold and thrust belt can be as narrow as several hundred meters. If the coast has dune fields, then flooding creates many smaller pools between the crests of the dunes. In some parts of the world, these lakes can also form in inland deserts, filled by rain or a rising water table from underground aquifers. 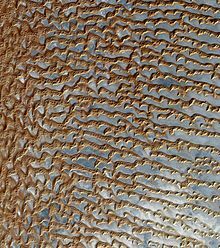 For example, large parts of the Empty Quarter in Saudi Arabia and the southern UAE consist of patterns of high drifting barchan dunes alternating with sabkha salt flats. In some places, the sabkha connect to form long accessible corridors into the desert. Dunes and salt flats south of the crescent-shaped Liwa Oasis (UAE). The third picture shows the area south of the crescent-shaped Liwa Oasis in the southern UAE. 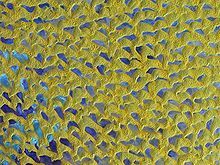 The picture is about 80km wide, with each sabkha about 2-3km long and 1km wide. You can see white deposits of salt covering the surface of the sabkha. The Moreeb Dune, rising 120m above the sabkha, is located roughly in the middle of the picture. The border between Saudi Arabia and the UAE is shown in red. The floor of a sabkha is usually a hard-packed combination of sand, mud and salt. It is easy to walk or drive 4x4 vehicles across the dry sabkha. However, after rains and flash-floods, the sabkha fill with shallow layers of water, and cannot be crossed until they dry out to form a new crust. When the ground is partly dried, a salt crust forms over soft mud or hollow cavities, and a vehicle will become stuck after breaking through the crust. Here are two current examples of dune fields being flooded. The first is not a desert, but a coastal dune field in the Amazon region, flooded by heavy rains. The second is a dry inland desert in the Gobi region, flooded by ground water from nearby mountains. Flooded dune field in the Lençóis Maranhenses National Park (Brazil). Flooded dune field in the Badain Jaran Desert (China). The climate is one of the main factors in sabkha development. Rainfall in this arid region usually occurs as thunderstorms and averages 4 cm/year. Temperatures can range in excess of 50 °C to as low as 0 °C. Humidity is linked to the wind direction, with humidity as low as 20% in the mornings from off the dry interior and building in the afternoon as a strong, onshore wind prevail. At night, relative humidity of 100% can lead to dense fogs. Water temperatures vary by depth with shallow water as much as 10 °C warmer. These high temperatures drive high rates of evaporation in the Persian Gulf, as much as 124 cm/year leading salinity to increase in the shallow lagoons to as much as 70 ppt. The net rate of evaporation from the sabkha can be as much as an order of magnitude less and has averaged 6 cm for the last 4,000 to 5,000 years. The reasons for this are that the sabkha surface is not a free-water surface, the high humidity during the night, and vertical stratification of the air column. Despite the loss of water due to evaporation, the groundwater, never deeper than 1.5 m, flows seawards and is recharged by continental waters, rainstorms, and the northwest "shamal” gale-force winds that create waves of greater height than the intertidal height and drive water as much as 5 km inland over the sabkha to a depth of a few centimeters. The climate variations lead to the very dynamic nature of a sabkha. Halite is deposited on the surface of the sabkha and gypsum and aragonite precipitate in the subsurface via capillary action from brines brought up from the water table. In drier parts of the sabkha the gypsum can be altered to anhydrite and the aragonite can be dolomitized diagenetically. Thermal contraction at night and expansion during the day leads to concave polygonal pans as the edges have been upturned, in part due to growth of evaporites wedging the crack apart. Below this is a gypsum mush where nodules of anhydrite and other sulfates may develop. These might also form a “chicken wire” crystalline structure. Below this are the intertidal deposits typified by laminated, organic-rich muds formed by the microbial mats that grade downward into more bioturbated muds. The subtidal facies show carbonate grainstones and lagoonal muds. These facies sequences, except for the halite that is frequently re-dissolved when wetted, can easily be preserved. Factors enabling preservation include the progradation of the sabkha with sedimentation rates of 1 m/1000 years and the creation of Stokes surfaces. These surfaces are created by the deflation of the sabkha surface that is related to the level of the groundwater table acting as a local base level. Sabkha deposits are believed to form some of the major subsurface hydrocarbon reservoirs in the Middle East (and elsewhere). The source of these hydrocarbons (both gas and oil) may be the microbial mats and mangrove paleosoils, found in the sabkha sequence, that have total organic carbon up to 8.2% and hydrogen indices typical of marine type II kerogens. Some ancient analogs include immediate subsurface formations such as the Permian Khuff, Jurassic Arab and Hith anhydrite, and Tertiary sedimentary rocks. Similar deposits are also found in the Ordovician Williston Basin, the Permian Basin in Texas, as well as the Jurassic Gulf of Mexico. Modern sabkhas are present in varying form along the coasts of North Africa, Baja California, and at Shark Bay in Australia. ^ Lokier, Stephen W.; Knaf, Alice; Kimiagar, Sean (2013). "A quantitative analysis of Recent arid coastal sedimentary facies from the Arabian Gulf Coastline of Abu Dhabi, United Arab Emirates". Marine Geology. 346: 141–152. doi:10.1016/j.margeo.2013.09.006. ^ Lokier, Stephen; Steuber, Thomas (2009-04-01). "Large-scale intertidal polygonal features of the Abu Dhabi coastline". Sedimentology. 56 (3): 609–621. doi:10.1111/j.1365-3091.2008.00988.x. ISSN 1365-3091.